Well my radiator is shot, plugged and leaky. So I'm paying around $500 to have the thing replaced. Gerr... Old cars repairs are expensive! So I go home, driving the loaner Chevy that Meineke lent me, looking at loans, interest rates, payments, different cars, all requiring hundreds of dollars per month for years! 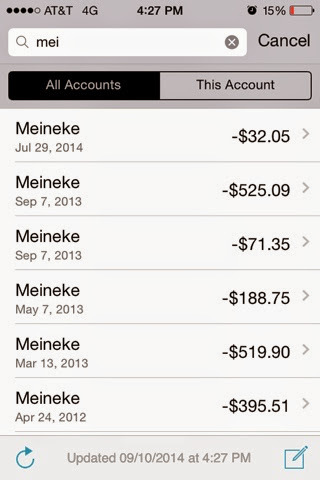 So I happened to look at my mint.com account, for my mechanic, Meineke, which has done a number of $500 repairs for me the last few years such as brakes, catalytic converter, and exhaust system pipes. I was quickly surprised how little my repair costs actually have been. In total over the last three years only about $3,000 rounding up. Not shown in the repair costs below are new tires, new rear shocks, a few oil changes done in person or paid in cash, or of course this week's repair. While $3,000 is significant, it is far less than the price of a new car. Given that math, it is costing me roughly $85 a month in repairs and oil changes to keep my old van, and only $45 in insurance per month. I realize that is still more than many people can afford, but compared to the hundreds of dollars my friends and coworkers pay for new cars and new car insurance, I'm keeping the van! 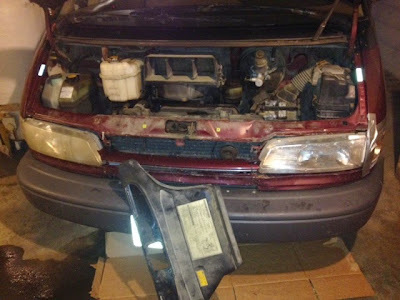 I'm up to over 317,000 miles on my 1993 Toyota Previa, and turns out replacing a radiator is not out of the ordinary for old cars. For the forseeable future I'm going to keep the old thing. Let's just say that a car payment would be $400 for 3-5 years depending on what kind of car I get. I can tolerate a lot of repair costs for $5,000 a year. Plus, insurance on new cars is significantly higher than on old used cars. In short, the math, at least this month, and over the last seven years of driving this old van are clear. (I had fewer repairs the first four years I drove it than in the last three years.) Driving an older car is a better investment, if any car can actually be called an investment and not only an expense, than buying a much newer car.